Reliance Steel & Aluminum (NYSE: RS) reported earnings on Feb. 21. Here are the numbers you need to know. For the quarter ended Dec. 31 (Q4), Reliance Steel & Aluminum missed estimates on revenues and beat expectations on earnings per share. Compared to the prior-year quarter, revenue dropped. GAAP earnings per share expanded significantly. 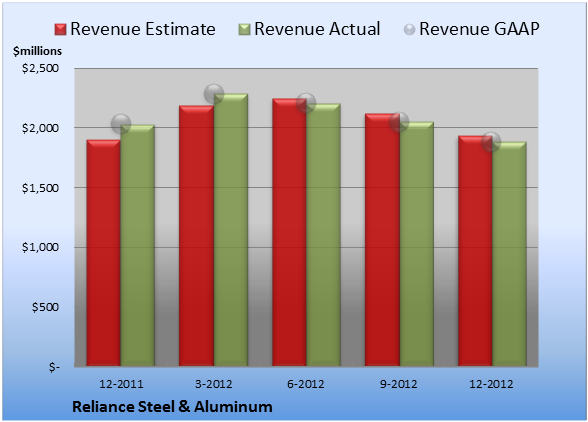 Reliance Steel & Aluminum logged revenue of $1.89 billion. The 10 analysts polled by S&P Capital IQ expected revenue of $1.94 billion on the same basis. GAAP reported sales were 7.1% lower than the prior-year quarter's $2.03 billion. EPS came in at $1.06. The 12 earnings estimates compiled by S&P Capital IQ predicted $0.98 per share. 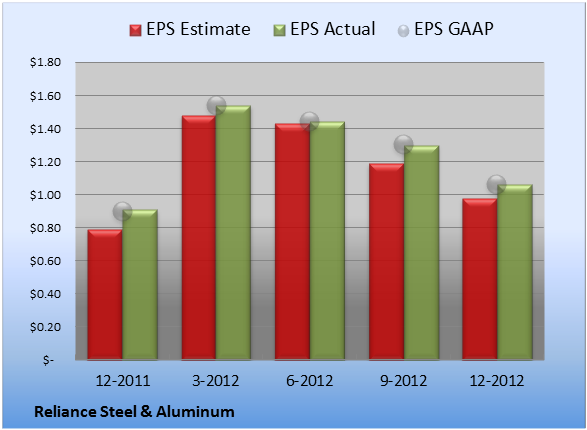 GAAP EPS of $1.06 for Q4 were 18% higher than the prior-year quarter's $0.90 per share. For the quarter, gross margin was 27.8%, 440 basis points better than the prior-year quarter. Operating margin was 7.2%, 170 basis points better than the prior-year quarter. Net margin was 4.3%, 100 basis points better than the prior-year quarter. Next quarter's average estimate for revenue is $2.14 billion. On the bottom line, the average EPS estimate is $1.19. Next year's average estimate for revenue is $9.07 billion. The average EPS estimate is $5.21. The stock has a four-star rating (out of five) at Motley Fool CAPS, with 543 members out of 569 rating the stock outperform, and 26 members rating it underperform. Among 140 CAPS All-Star picks (recommendations by the highest-ranked CAPS members), 132 give Reliance Steel & Aluminum a green thumbs-up, and eight give it a red thumbs-down. Of Wall Street recommendations tracked by S&P Capital IQ, the average opinion on Reliance Steel & Aluminum is outperform, with an average price target of $63.83. Steel is for real, but gold is shiny and increaingly popular as a hedge among those who fear inflation. Should you move beyond Reliance Steel & Aluminum and look into a precious metal play? Find out how Motley Fool Analysts think you can profit from inflation and gold with a little-known company we profile in, "The Tiny Gold Stock Digging Up Massive Profits." Click here for instant access to this free report. Add Reliance Steel & Aluminum to My Watchlist.